The exhibition of international quilt art “Quilt Art: International Expression” is on at the Minnetrista Cultural Center in Muncie, Indiana, through August 29, 2010. The Johnson Museum at Cornell University in Ithaca, NY will have a quilt exhibit, “American Quilts from the Terasaki Collection” from June 26 to August 1, 2010 at Cornell University’s Johnson Museum in Ithaca, New York. If you’re anywhere near the Finger Lakes check it out. 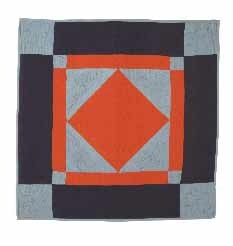 The quilts are 19th and early 20th Century American quilts from the collection of Etsuko Terasaki. The Quilters Hall of Fame has their first exhibit of Marie Webster’s quilt designs in Marie’s original home, now the site of the Qulters Hall of Fame Museum in Marion, Indiana. The exhibit, which runs now through July 7, 2010, features four quilts made by Marie between 1912 – 1936, as well as her designs as interpreted by other quiltmakers during the last century. For information about other Quilters Hall of Fame quilting pioneers, including Ruth Finley, Ruby Short McKim, and Jean Wells, visit The Quilt Show’s Articles page here. Anyone who is traveling to Ohio this summer won’t want to miss this exhibit of sixty-six Amish quilts, “Quilting Traditions: The Art of the Amish” at the Dairy Barn Art Center in Athens, Ohio . The exhibit is curated by two of my colleagues, Dee Dadik and Molly Butler. An exhibit of 19 crazy quilts from Vermont’s Shelburne Museum’s Collection is showing now through October 24, 2010. Ella Chase, Crazy Quilt, Derby Line, Vermont, 1890-1900, Collection of Shelburne Museum. Photo is the Museum’s. Tristan Quilt on Exhibit at Museo Nazionale del Bargello in Italy, through July 4, 2010. Photos Online. A local quilter, Silvana Vannini, has made an exact replica of the quilt for permanent display at Palazzo Davanzati. Another artisan has made a replica of the portion of the Tristan quilt at the Victoria & Albert Museum in London, which will also be displayed at Palazzo Davanzati.